Can Ginkgo Biloba Combat My Menopause Symptoms? Ginkgo Biloba, also spelled gingko, is a unique tree that has no living relatives. From the earliest years of human history gingko has been used for food and medicine. Ginkgo biloba is known to have many positive effects on the human body; improvement of blood flow, protection against oxidative cell damage, enhancing mental alertness, combating mental fatigue and blockage against blood clots. Nowadays ginkgo is prescribed in Europe and used by many people in the U.S., Canada and other countries for its medicinal properties. It is now widely used as an herbal treatment for mind enhancement and various other diseases. Taking ginkgo as one part of a healthy lifestyle will help you But although ginkgo biloba has the capacity to help combat some symptoms of menopause there are also some risks that are important to consider before using gingko biloba. Anyone who has experienced blood circulation disorders and those taking anticoagulants such as ibuprofen or aspirin must exercise extreme caution when taking ginkgo biloba. This is because ginkgo biloba helps with circulation, if you are already experiencing blood circulation disorders it can cause an adverse effect, including an increased risk of bleeding. Other side effects include upset stomach, diarrhea, nausea or headaches. If you find yourself experiencing any of these side effects you should lower your dosage of the supplement or quit taking ginkgo biloba altogether. Gingko biloba should also not be taken with certain antidepressants and should not be taken by women who are pregnant or thinking about becoming pregnant because of the increased risk of bleeding. But there are other more serious side effects that have been reported by people taking ginkgo biloba. These more serious but less common side effects include: easy bleeding or bruising, fainting, irregular heartbeat, inability to move (paralysis), muscle weakness, restlessness, slurred speech, seizures, severe headaches or vision problems. If you find yourself experiencing any of these symptoms you should seek medical attention immediately. Ginkgo biloba, similar to many other natural herbs, have the ability to fight different symptoms of menopause, but not menopause all together. So taking this herb in conjunction with other lifestyle changes will be your best bet in warding off menopausal symptoms. If you want to learn more click on the following link to find out about ginkgo biloba and menopause. Can Ginkgo Biloba Boost My Concentration Levels During Menopause? 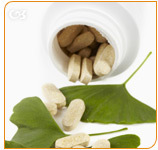 Can Ginkgo Biloba Boost My Memory During Menopause?